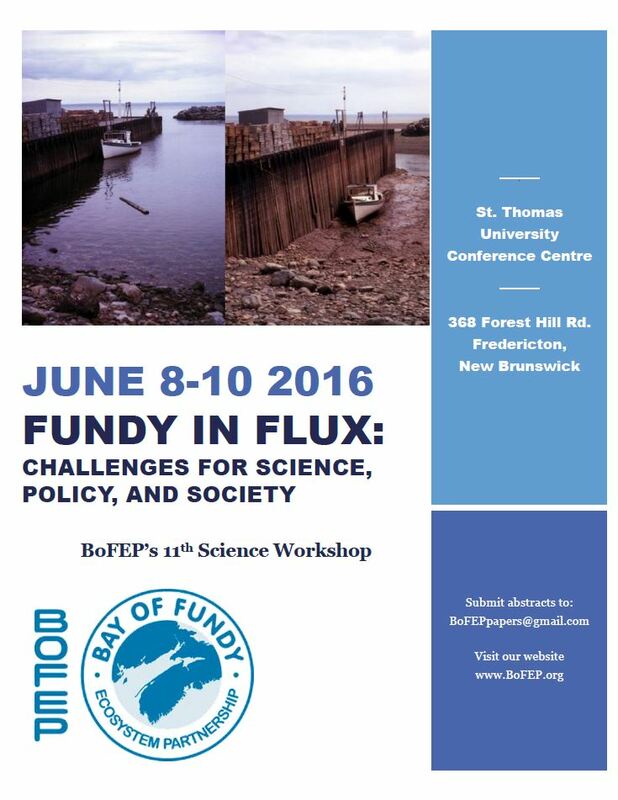 The Bay of Fundy Ecosystem Partnership (BoFEP) is pleased to announce its 11th biennial BoFEP Bay of Fundy Science Workshop will take place in Fredericton, New Brunswick June 8-10th at the St. Thomas University Conference Center: #15 – Rigby Hall/Forest Hill on the STU campus map. 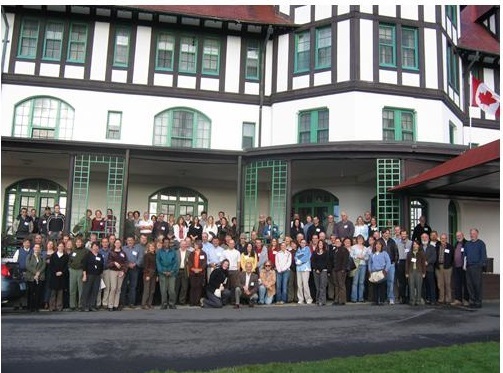 The 11th BoFEP Bay of Fundy Science Workshop will bring together individuals from around the Bay of Fundy and beyond with an interest in various aspects of integrated ocean, coastal and watershed management. 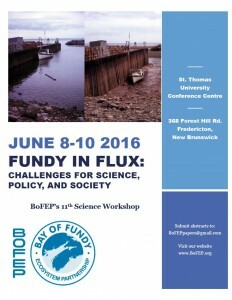 Together we will explore the conference theme: Fundy in Flux: Challenges for Science, Policy and Society with an exciting agenda of plenary discussions, technical breakouts, and an interactive poster session. 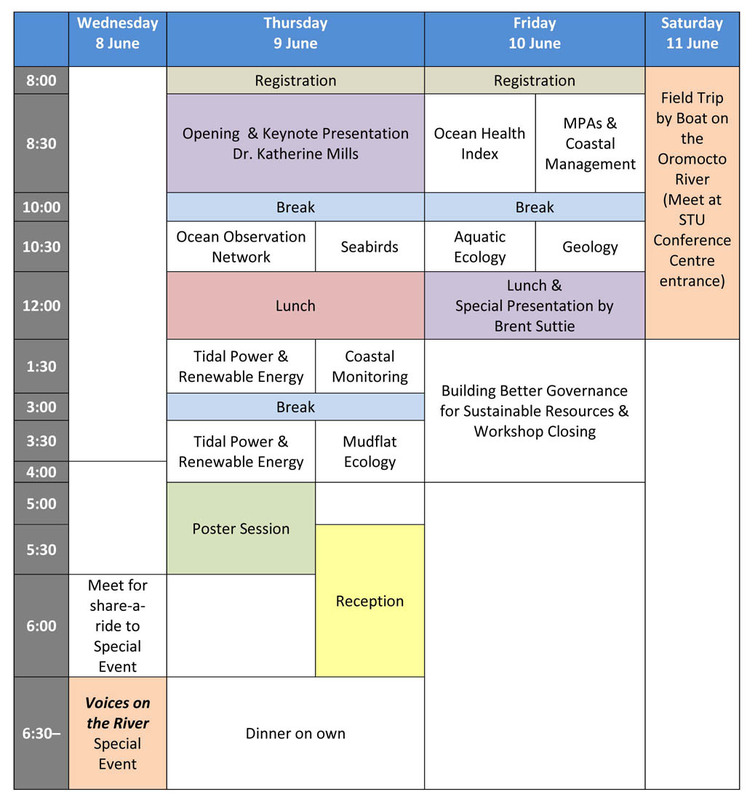 We are now accepting presentation and poster abstracts on the conference theme and the topics listed below. In order to understand change, predict change and mitigate it where possible, we need to better understand the ecology of the Bay of Fundy. This workshop will review indigenous historical knowledge and move forward to our current state of knowledge of ecological factors in the Bay, in order to project into the future and give citizens, researchers, scientists and policy makers an opportunity to identify tools that are needed, the current status of those tools and the work required to make them fully usable for prediction and mitigation. university residences, hotels and B&B’s. Book early. BoFEP conference participants are invited to join local Indigenous Peoples at the confluence of the Wolastoq and Nashwaak Rivers for an evening of “Voices on the River”. In this collective workshop, the Drum will open the session. Indigenous Elders, Aboriginal Traditional Knowledge (ATK) holders, and Indigenous Environmental Technicians will share traditional knowledge about the river, current relationships to water, how knowledge comes from the land — its embeddedness in the river — and use of that knowledge in water protection at the community and watershed levels. 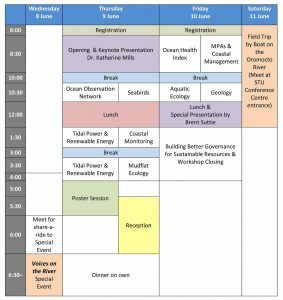 The speakers and ATK holders will provide an Indigenous worldview that can guide the incorporation of ATK in the development of programs and policies relating to environmental decisions and management regimes, progressive education processes, training, relationship building and research. Everyone in attendance will also be invited to share their ideas in a Talking Circle. Speakers will include:Wendy Wetteland, President & Chief, New Brunswick Aboriginal Peoples Council; Chris Brooks, Community Drum, St. Mary’s First Nation; Amber Giles, Environmental Technicians, Maliseet Nation Conservation Council; Ron Tremblay, Grand Chief, Wolastoq Grand Council; Jason Harquail, Aboriginal Seafood Network, New Brunswick Aboriginal Peoples Council; ,Joshua McNeilly, IKANAWTIKET, Maritime Aboriginal Peoples Council; Elders. NOTE: If the weather is inclement, we will meet at the intended location at St. Thomas and then go together to the board room of the NBAPC (New Brunswick Aboriginal Peoples Council) building for the presentations. 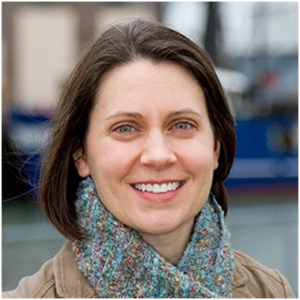 Dr. Katherine Mills is an associate research scientist at the Gulf of Maine Research Institute in Portland, Maine. As a quantitative fisheries ecologist, Kathy has studied ecosystem change and fish-ecosystem relationships in the Gulf of Maine region for over a decade. Much of her work is interdisciplinary, seeking to understand and inform management of fisheries as coupled social-ecological systems. Her recent work focuses on (1) understanding the potential impacts of environmental variability and climate change on marine resource populations and fisheries and (2) assessing climate adaptation strategies and providing information needed to advance adaptation planning in marine fisheries and fishing communities. of Past Occupation within the Bay of Fundy”. 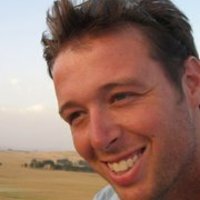 Brent Suttie is the New Brunswick Provincial Archaeologist and Director of the Archaeology Branch of the NB Department of Tourism, Heritage and Culture. His specialty is reconstructing past landscapes and determining when they were occupied. Suttie He has been a professional archaeologist for 16 years and has been involved with over 100 sites in New Brunswick. He has also worked internationally on archaeological sites in Britain, Belize, Turkey, and Egypt. In 1995, when he was still in high school and hanging around the family cottage in Charlotte County’s Lake Utopia, he ventured out on a hike that eventually propelled him on his career path. Mr. Suttie stumbled across some stone tools. His discovery led to the oldest radiocarbon-dated archaeological site in New Brunswick. “I have always been interested in archaeology and the stone tools only heightened my interest,” said Mr. Suttie, a native of Black’s Harbour.”When I found them, I had no idea how old any of them were. Since coming to UNB, I’ve been able to find out so much more about them.” Brent was trained at the University of New Brunswick, receiving his undergraduate diplomas there and then his Masters. Much of his time involves field work in various locations along coastal New Brunswick and developing ac unifying model for coastal submergence. Recent Paper by Brent Suttie et al. : Recent Research on Four Sites Spanning 13,000 years from Southwestern New Brunswick, Canada. BoFEP and New Brunswick DNR is pleased to offer workshop participants a chance to enjoy a stimulating and informative 3-4 hour boat trip on the Oromocto River to explore its wetlands and floodplain ecosystems. The start point is only 20 minutes from the conference site. The Oromocto River upstream from the town of Oromocto is wild with no sign of human installations as it all floods during the freshet. There is no charge to participate in this field trip, but those interested are asked to register on Eventbrite as soon as possible to reserve a place as space is limited.